I like a good pun, don’t you? 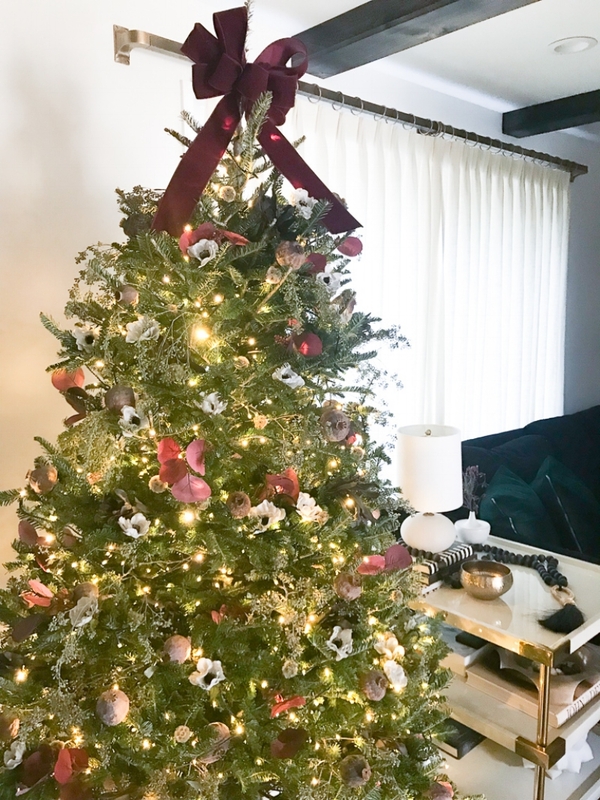 When I needed a name for this blog post, I was trying to determine what the name of the color was in our Holiday decor….wine? merlot? burgundy? I chose Berry just so I could name the post “A Berry Merry Christmas”. HA! Once again, I am participating in the Winter Eclectic Home Tour Hosted by Jessica Rey of Domicile 37 (thank you for having me!) I cannot believe it is Christmas time already. I feel like I just put away our holiday cheer into those big plastic totes and tucked them away, but here we are again. I have a love/hate relationship with decorating for holidays. I hate bringing more items into a room as it often makes it feel cluttered. On the other hand, I hate removing my precious items because so many of my decor finds are very special to me. This year I tried to find a balance by swapping out a few things and keeping it overall very minimal. 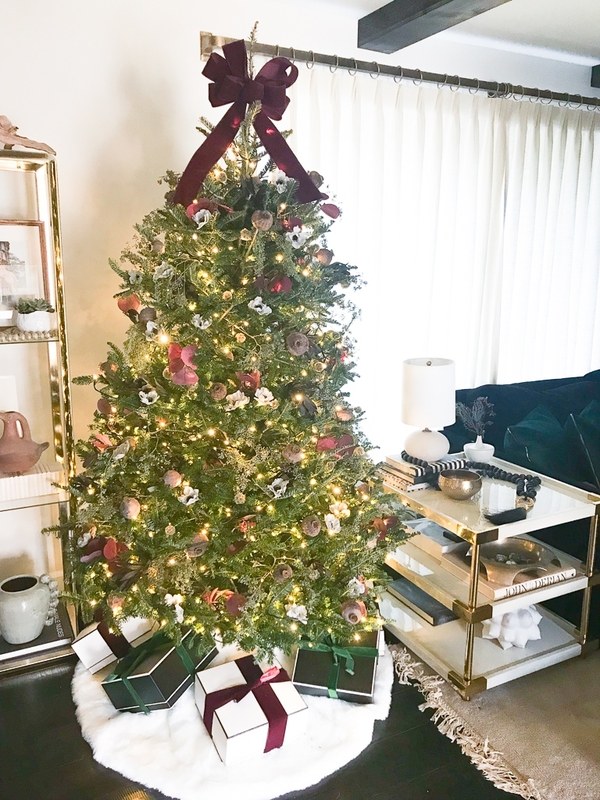 While our normal holiday styling is usually pretty neutral, I was inspired by a CB2 holiday ad and wanted to use this rich berry color within our home. I reached out to the owner of Willow and Star Flowers, Allyson Wells Podell, for some guidance on finding the winning combinations of flowers. With her help, I landed on a mix of anemones, naked seeded eucalyptus, tinted eucalyptus, poppy seed pods, and scabiosa seed pods. I threw in some preserved burgundy stems I had leftover from thanksgiving to add some depth and additional color. All but two of the flowers on the tree are real (preserved) but I did have to rely on good ole silk for the tinted eucalyptus and anemone. I would love to grow my collection of preserved flowers and to build on this for next year! Underneath the tree are my favorite gift boxes from Target. These have been around for years and come in different colors each season. I used some lush berry and green velvet to garnish the simple boxes and all lay on this faux fur tree skirt that I have been using for years. Faux LED candles adorn the top along with some velvet ornaments from Hobby Lobby. While our tree did not have any traditional ornaments, I use them within the mantle and to fill bowls. Generally I don’t decorate our railings/entry too much since it is not being renovated. However, since we have these beautiful new railings, I thought I might as well. The pictures will show the reality of a reno in the background but hey, it’s real life! Well, folks, that’s all I have to share with you thus far. To say we are behind with filling our home with festive goods would be an understatement. Sometimes life just happens and you have to go with the flow. 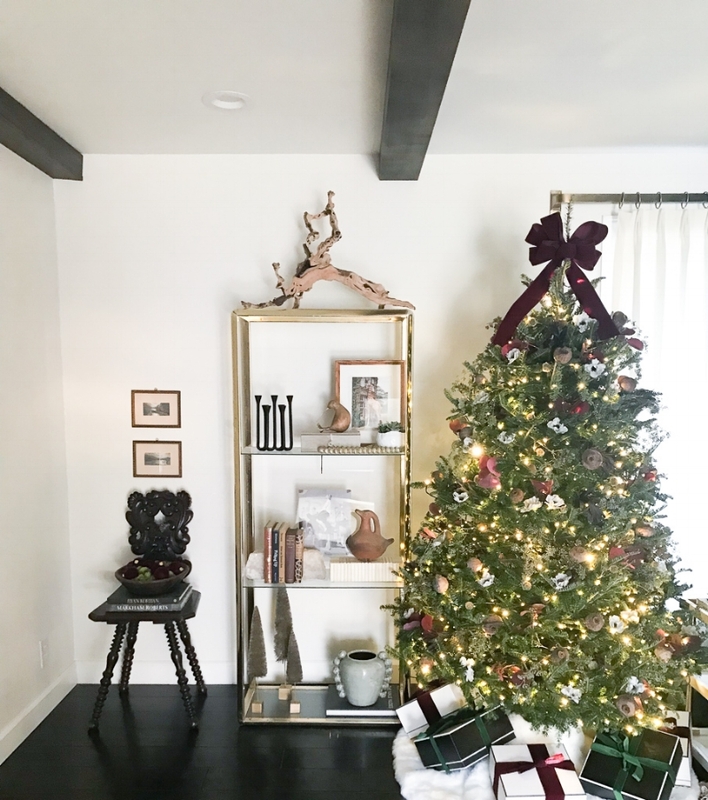 I am shooting to finish up our holiday decor over the weekend and I will share the rest with you via good ole Instagram. Thank you again to our Host, Jessica Rey, for hosting this fun blog hop. Be sure to swing by the other tours for some lovely home decor eye candy!